This garden built in 1678 is a dry landscape garden that took in Mt. 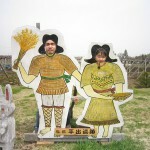 Hiei as a part of garden (Shakkei) could be the masterpiece of Shakkei* garden. Shakkei : the technique of forming a dynamic scene by taking nature into the scenery in a garden as a background. Hours : Apr – Nov | 10:00 a.m. – 4:30 p.m. Dec – Mar | 10:00 a.m. – 4:00 p.m.